“Ignorance is bliss. Until it isn’t.”—Kate Davidson in A Killer Retreat. Today is my weekly posting for Inkspot, the blog for authors of Midnight Ink. I’m blogging about fear, uncertainty, and the yoga teachings on finding clarity. Check it out! This entry was posted in Downward Dog Mysteries, writing on March 30, 2015 by Tracy Weber. This is an excellent question, and it brings me back to the true purpose of Corpse Pose. Corpse Pose isn’t a time of quiet nothingness. It’s a period of active meditation. Snoring is simply another of life’s many distractions, not all that different from ringing cell phones, rumbling lawnmowers, or annoying music. Our reactions to life’s distractions are more about us than the distractions themselves. Imagine, if you will, a happy yogini—I’ll call her Judy—resting on her back in a blissful Savasana. The man next to her starts snoring. Snoring is simply a sound, neither good nor bad. The yogini’s gremlin mind, however, makes it all about her. Oh good Lord, that man is snoring again. Why doesn’t the teacher do something about it? Doesn’t she realize that man is ruining my practice? Left unchecked, Judy’s mind will reel with righteous indignation, as if one man’s cat nap is some sort of attack on her personally. Judy’s practice may indeed be ruined, but I’m not so sure it’s the snorer’s fault. Instead of your letting your monkey mind take control over you, why not take control over it? There are many different ways to do this, but one of the most powerful is to simply notice. Not the sound that’s distracting you, but your reaction to it. Do you feel irritation? Humor? Embarrassment? Frustration? Whatever you notice, don’t allow your mind to amplify it. Instead, notice the thought; notice the emotion. Then bring your mind back to the feeling of the breath in your body. Over time, you might that the snoring isn’t nearly as distracting as you originally thought. Remember, yoga is a symbol of the rest of your life. Do you have similar thoughts and reactions to distractions in your daily life? Would your life be more peaceful if, instead of allowing your thoughts to control you, you controlled them? If you learn how to remain focused during distraction in Savasana, you might notice a ripple effect in the rest of your life. This entry was posted in Meditation, Student Questions and tagged corpse pose, savasana on March 23, 2015 by Tracy Weber. As many of you know, I’ve been traveling to promote my most recent mystery. The greatest part of conferences and signing events is getting to know other writers and readers on a more personal level. I have to admit though, it’s challenging for me. I don’t like traveling without my loved ones, and I’ve already earned more than my share of frequent flyer miles. Still, I’m forcing myself to get out there and do it. Most of the time I feel great about my interactions. Sometimes, I don’t. This past weekend I had an odd conflict that ended badly. No blows were thrown. Neither of us landed in a jail cell. But I’m pretty sure that a newly forming friendship was irreparably damaged. The argument started over dinner when a fellow writer animatedly criticized the presentations at a “new author” event. I pretended to take her words personally (I was one of the presenters) but that wasn’t the issue. I felt quite confident in my performance that morning. Pretending to be personally affronted was simply the easiest way to end the discussion. Or so I thought. My true emotion was one of protectiveness–like a grizzly bear defending her cubs. Frankly, I was happy for my new author friends that morning. Public speaking comes easily to me. I’ve done it competitively since I was 14, and I make my living teaching. But for some people, it is terrifying. Finding the courage to present to over 100 people can be a huge accomplishment. It’s easy for someone with greater experience to pass judgment on a newbie’s less-than-perfect job. It’s even easier to talk about it when the person being criticized isn’t in the room. But who does it help? Believe me, I’m not the victor here, and no one who watched that interaction would want me as their role model. I suspect that if you asked five of the six people at the table, they’d tell you I was the one out of line. But there’s a lesson to be learned, and that lesson is worth sharing. The yoga teachings on communication say it best. In hindsight, that’s what I should have done at that dinner. Said nothing. Even better, I should have simply found an excuse to leave the table. And, as the Sutras also teach, my reaction said more about me than the person I reacted to. Maybe I’m more like my protagonist, Kate, than I care to admit. It’s time for me to re-examine the other communications in my life. I already see a few patterns that need changing. How about you? Are there times you should say nothing? This entry was posted in writing, Yoga Philosophy on March 16, 2015 by Tracy Weber. I recently finished reading the pre-work essays for my newest yoga teacher training. Now that we’re underway, I have a confession to make: I didn’t want to start this training. Having second thoughts at the beginning of a new class isn’t unusual for me. Leading this program is a ton of work and responsibility. Every time I choose to begin, I commit to a year of being present both physically and emotionally to support the hearts, dreams, and aspirations of seedling yoga teachers. As most people know, my husband’s and my life may change significantly in the coming year, which has caused us to rethink where we will live. And even if we stay in Seattle, I’m likely to spend more time writing my thoughts than saying them out loud. None of that was the real problem, though. My biggest obstacle to bonding with this group was my attachment to the class that preceded them. I love all of my students, but my last advanced class was special. We’d been together for over two years, and they had cemented themselves permanently in my heart. I said goodbye to them at a retreat that felt deep, profound, and transformational. The perfect finish to my yoga teaching training career. I was complete. And I was scheduled to start another class in less than a month. I had no choice, at least not one I could live with. Some of the students in my new group had been waiting for this program for over two years. All had reorganized their lives to accommodate eleven months of training. When I accepted them into the training, I made a promise. And when I promise something, I always deliver. Today I realized why. After reading about the life experiences of these thirty-two yogis, I can say that I’m touched. They have arrived at my doorstep via pathways paved with challenges. They’ve endured traumas: divorce, death, illness, addiction. They found respite in yoga, and they know that yoga is about more than stretching your hamstrings. Yoga is about finding clarity, entering life’s battlefields without flinching, and making it to the other side whole. I don’t know why I’ve been so blessed. Lord knows I’m not always the most yogic yoga teacher. When it comes to teaching yoga, I have reasonable talent, but I’m certainly no rock star. There’s very little I offer that others couldn’t do as well or better. Yet for some reason, the universe has gifted me with many wonderful students to help guide my journey, all while I pretend to guide theirs. As for this new crop of students, I can say one thing with certainty: I’m falling in love all over again. Thank you for sharing the next year with me. This entry was posted in Gratitude, Teacher Training, Teaching Yoga and tagged gratitude, yoga teacher training on March 9, 2015 by Tracy Weber. This week’s blog entry was written by guest author Jenny Zenner. Jenny is a graduate of Whole Life Yoga’s teacher training program and a promising writer. She can be contacted at jzenner@gmail.com. Toying with the idea of meditating? Maybe you think to yourself, yeah, but it looks like you need all this paraphernalia. I don’t have a puffy cushion or a gong or an auspicious altar. So how can I even begin? I’ll admit, I’m someone who likes a prop or two. I own a few sets of mala beads including a string of bodhi tree seeds harvested from the mountaintop where the Buddha attained enlightenment. Guess what…you don’t need all the props. You already have everything you need: your body and your breath. If you are someone who wants a prop or two, I’ll show you how you can take simple household items and make do. What better time than Mardi Gras aka Fat Tuesday? Mardi is Tuesday in French. Mardi Gras falls on the eve of Lent, the day before Ash Wednesday. It’s a time of closing out winter and inviting spring, clearing out and indulging before a time of repentance. Celebration. Part of that celebration in the New Orleans festival includes tossing strings of beads from floats in parades. Down in the French Quarter those beads are earned by women willing to lift their tops. Regardless of how you may have come into possession of a set, if you happen to have some stuffed in a drawer or dangling from your rear view mirror, grab them and find a seat. No party beads? No problem. Pull out your grandma’s pearls, a rosary for you Catholics, or even a string of Christmas lights. If the string you are using doesn’t have a marker on it like a clasp, larger bead, or cross, simply tie a ribbon or rubber band on it so you have a start and end point. 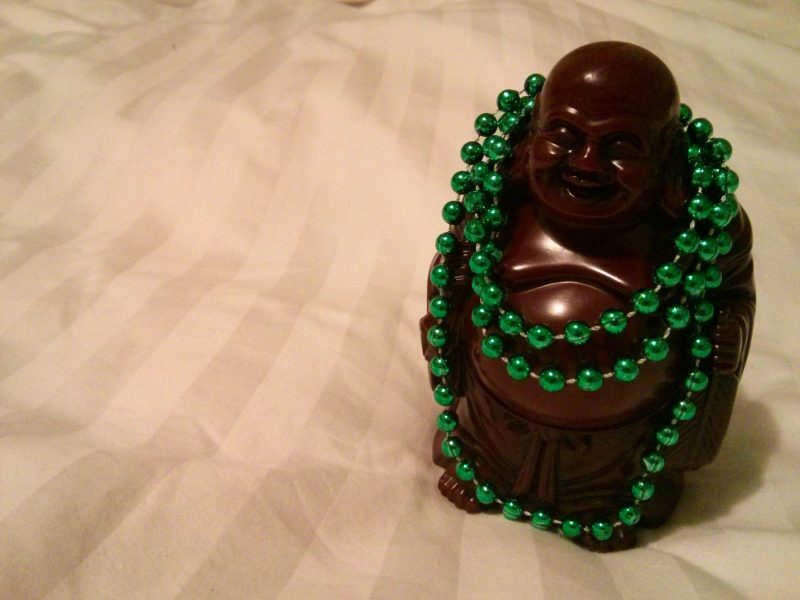 When I meditate with a string of beads, I have a tangible timer. I don’t have to worry if I remembered to set my phone or watch. An annoying alarm doesn’t jolt me out of my meditative state. When I get impatient, I can always take a peek to see how close I am to nearing the end of the string. Find a comfortable seat in a chair, on the floor, a park bench, or the solace of your car in a parking lot. Hold the string in one hand between your thumb and middle finger (picture holding a pencil). With your thumb on the bead next to your marker, take a breath in and release the breath. At the end of your exhale, let your thumb advance to the next bead and breathe your inhale and exhale. If you find your mind wandering, tell yourself breathing in with your inhale, and with your exhale tell yourself breathing out. Keep it simple, come back to the bead in hand and your breath. Advance until you are back at your marker. Going through my string of 108 beads takes less than 15 minutes. I also have a bracelet with 12 beads for a mini meditation. Repurpose those party beads for a joyful practice. Jenny Zenner founded Seeds Yoga www.seedsyoga.com. Based in Seattle, WA, she’s a former addictions counselor turned yoga teacher, recruiter, career coach, and writer, being mindful in as many moments as she can muster as a mom to twin boys. Follow her on Twitter or Facebook and of course connect on LinkedIn. This entry was posted in Guest Writers, Meditation, Teacher Training Graduate Stories on March 2, 2015 by Tracy Weber.